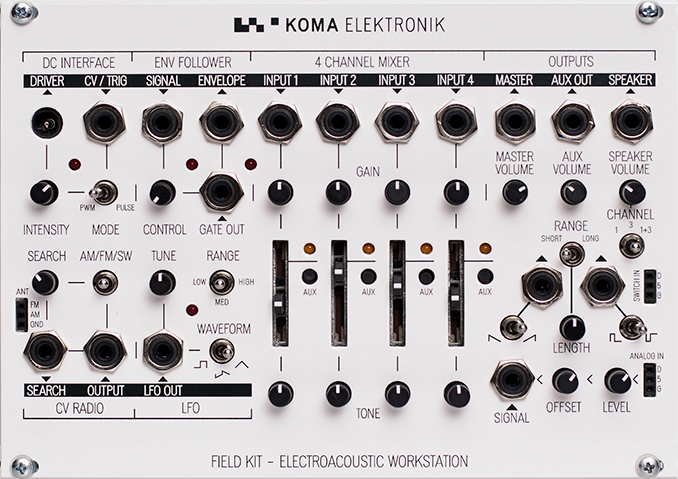 I picked up a Koma Field Kit from a local dude a few weeks ago, and have had a little fun with it - it came with the 'expansion' kit and a bunch of springs, but I need to have it integrate more with the rest of the modular - to make it more 'wacky'. All of the stuff I did as a standalone was a little 'meh'. It's not like I couldn't figure out how to make something less 'meh', but I realized that I'd put it on the shelf because I wasn't having fun. But really, a radio, LFO, envelope follower and mixer should provide me with plenty of fun, right? I think that I just need to embed it in the modular so that it can have a little interplay with the rest of the modules. So I ordered the Eurorack plate for it, and hope to have it play a role. Not sure which role - or maybe just a new role - but maybe this will open the door to fun, right? Since I have an OK power supply in my rig, it should be good unless I start driving motors with it (or something). I'll try to keep it sane, and let y'all know about it once I find out more. Oh dear! We've made it now! Randy Writes - Musings from Madrona Labs!